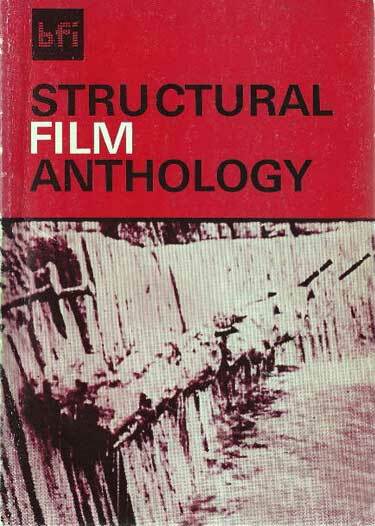 This anthology of texts about what have been termed Structural Films attempts to bring together some of the more important essays and articles on those films which have formed the core of film work in this field since its inception. It is a first attempt to bring together texts from Europe, Britain and the United States. In the past we have been inundated with the parochial, American view of avant-garde film work, as expounded on both sides of the Atlantic. This anthology was published to coincide with the series of eighteen programmes, Structural Film Retrospective, at the National Film Theatre, London, in May 1976. 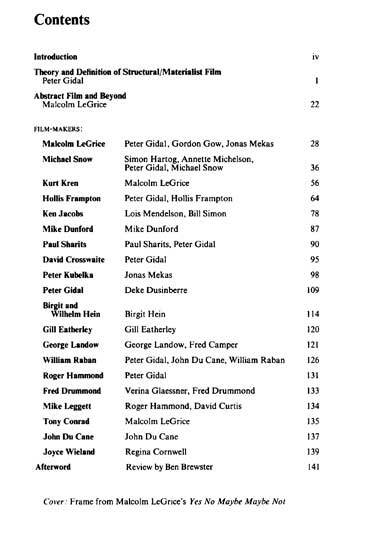 As it happened, no film-maker was included in the programmes who had not produced relevant work before 1971, though many works were from after that year. No new films were introduced; this was a retrospective programme intended to enable a viewing that saw each film in the context of each other film, that could recognise alliances and misalliances between films, that could attempt to deal with the individual filmworks and the critical practice which preceded or followed. In some cases, the critical practice here is a virtually complete repression through ideology of the text of the film; in the gaps presented work can now take place. The lengths of the sections are dictated by the materials of interest available, and unfortunately in a few cases only very slight material existed. I hope that the selection will not offend; the younger Americans have been left out, as have many of the younger British, because of the wish for a solid retrospective programme as elucidated above. No doubt there are quite a few film-makers completely unknown to me, and to nearly everyone else, who have done and may be doing very important work, and whose work remains 'out of view' for a variety of sociological reasons, none of which are praiseworthy. I wish to thank all the film-makers and writers, obviously.